Ben Nevis, the highest mountain in Great Britain, located at the western end of the Grampian Mountains in the Lochaber area of Scotland. Scotland is the most mountainous country in the United Kingdom. The area north and west of the Highland Boundary Fault is known as the Scottish Highlands (or simply Highlands), and contains the country's main mountain ranges. The southern and eastern parts of Scotland are usually referred to as the Scottish Lowlands, but these areas also have significant ranges of hills, although they are lower than the Highland mountains. Within the Lowlands are two regions: the Midland Valley (or Central Lowlands), and the Southern Uplands. The Midland Valley consists of rolling plains interrupted by volcanic outcroppings. The Southern Uplands form a continuous belt across southern Scotland from Galloway to the Borders and is divided into five local ranges. The majority of the country's population resides in the Midland Valley, allowing the remote Highlands and Southern Uplands regions to remain unscathed by the advancements of civilization. Rugged and romantic, they are places of allure, places of dreams and escape. However beautiful the environment, the history of these hills did not escape tragedy. Its long and complex history includes brutal battles and betrayals during the Wars of Scottish Independence, the 1692 Massacre of Glencoe and both the Highland and Lowland Clearances in which large segments of the population lost both their homes and their homeland. Nevertheless, these mountains and hills continue to offer both inspiration and relaxation to all who visit. Sunset on Goatfell, Isle of Arran. June 2005. Scotland comprises the northern third of the island of Great Britain, off the coast of northwestern Europe. The total land mass is around 30,414 square miles. Scotland's only land border is with England, running for 60 miles between the River Tweed on the east coast and the Solway Firth in the west. The country consists of a mainland area plus several island groups. The mainland has three areas: the Highlands in the north; the Central Belt, and the Southern Uplands in the south. The Highlands are generally mountainous and are bisected by the Great Glen, which includes Loch Ness. 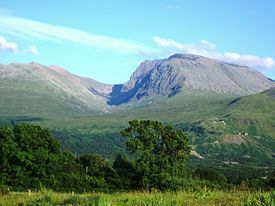 The highest mountains in the British Isles are found there, including Ben Nevis, the highest peak at 4,409 feet. The Central Belt is generally flat and is where most of the population resides. This area is divided into the West Coast, which contains the areas around Glasgow; and the East Coast which includes the areas around the capital, Edinburgh. The 'Highland Boundary Fault' is a geologic fault that traverses Scotland from Arran and Helensburgh on the west coast to Stonehaven in the east. 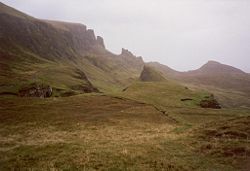 It separates two distinctly different physiographic regions: the Highlands from the Lowlands, but in most places it is only recognizable as a change in topography. The fault allowed the Midland Valley to descend as a major rift by as much as 4,000 meters, and there was subsequently vertical movement. This earlier vertical movement was later replaced by a horizontal shear. A complementary fault, the 'Southern Upland Fault', forms the southern boundary for the Central Lowlands region. The Scottish Highlands include the rugged and mountainous regions of Scotland north and west of the Highland Boundary Fault, although the exact boundaries are not clearly defined, particularly to the east. The Great Glen divides the Grampian Mountains to the southeast from the Northwest Highlands. The Highlands are popularly described as one of the most scenic regions of Europe. The Grampians, the main belt of mountains across the center of Scotland. The Cairngorms form the eastern part of the Grampians. The Northwest Highlands, lying to the north and west of the Great Glen. Cuillin, on the Isle of Skye. The southern and eastern parts of Scotland are usually referred to as the Scottish Lowlands, but these areas also have significant ranges of hills, although these are lower than the Highland mountains. In addition to the main ranges, there are numerous individual hills in the Lowlands, often volcanic in origin. Many are known by the Scots word Law, meaning hill. The Southern Uplands is the southernmost of Scotland's three major geographic areas. It is a range of of hills nearly 125 miles (200 km) long, interspersed with broad valleys. They lie South of the Southern Uplands fault line that runs from Girvan on the Ayrshire coast in the West to Dunbar in East Lothian on the North Sea coast. The Southern Uplands is the least populated of the three major Scottish geographic areas. This continuous belt is divided into several local ranges; Carrick, Lowther Hills, Pentland Hills, Moorfoot Hills and Lammermuir Hills. Scottish peaks are categorized by means of the following hill lists. Note that any one peak may ‘qualify’ for inclusion in several lists. The Munros comprise all hills in Scotland over 3,000 feet (914.4 m). The list was originally compiled by Sir Hugh Munro in 1891, and is modified from time to time by the Scottish Mountaineering Club (SMC). It includes 284 peaks. The Corbetts are hills in Scotland between 2,500 and 3,000 feet (762 and 914.4 m), with a relative height of at least 500 feet (152.4 m). The list is maintained by the SMC, currently 219 peaks listed. The Grahams are hills in Scotland between 2,000 and 2,500 feet (609.6 and 762 m), with a relative height of at least 500 feet (152.4 m). The list was first compiled by Fiona Graham. Currently 224 listed. The Donalds are hills in the Scottish Lowlands over 2,000 feet (609.6 m). The list was originally compiled by Percy Donald, and is maintained by the SMC, 89 peaks are listed. The Marilyns are hills in the British Isles that have a relative height of at least 150 m, regardless of distance, absolute height or merit. The list was compiled and is maintained by Alan Dawson. There are currently 1,214 Scottish peaks listed, see List of Marilyns in Scotland. The ten highest mountains in Scotland are also the ten highest in the United Kingdom. Because of the geographical orientation of Scotland and its strong reliance on trade routes by sea, the nation has historically held close links in the south and east with the Baltic countries, and through Ireland with France and the continent of Europe. This land of unspoiled beauty has a long and complex history, including the English military occupation during significant periods of the Wars of Scottish Independence (1300-1400s), the Massacre of Glencoe (1692) which occurred during the era of the Glorious Revolution and Jacobitism. In addition, the Highland Clearances were forced displacements of the population in the eighteenth century, leading to mass emigration to the coast, the Lowlands, and abroad. Part of the process of agricultural change throughout the United Kingdom, it was an abrupt change from the clan system with brutality occurring in many of the evictions. Following the Scottish Enlightenment and the Industrial Revolution, Scotland became one of the commercial, intellectual, and industrial powerhouses of Europe, producing philosophers such as Adam Smith and David Hume, and inventors and entrepreneurs such as Alexander Graham Bell, James Watt, and Andrew Carnegie. ↑ Encyclopædia Britannica Online. 2008. Scotland Retrieved May 20, 2008. Jim Willsher Website. Hills of Scotland Retrieved May 21, 2008. The Mountaineering Council of Scotland. Mountaineering Council of Scotland Retrieved May 21, 2008. History of "Mountains and hills of Scotland"
This page was last modified on 4 December 2014, at 18:02.